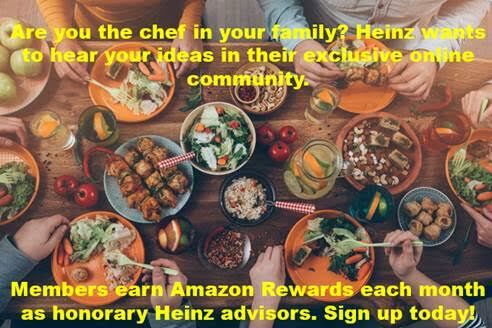 If you have a lot to share on what it’s like to prepare meals for your family, and how you stay ahead of the game to keep things simple,Heinz wants your voice to play a role in their future. Spots are limited so signup today to start talking all things food: http://bit.ly/2lJi8yo. Aw, I applied and it says all openings for my group have been filled!! Maybe some other time 🙂 I love groups like these!! I applied and my group has been filled. I still check many of these type of sites for new recipes. Sounds like a great program. Unfortunately, I have no children to qualify for this program. I’ve been in a couple of their groups but this one was full…. For me it is full also. I think groups like this can be fun and interesting. It is a way to tell companies what works and what doesnt, plus make money. I have a tad less time now than I used to so am trying to limit, but this would be great for someone who has a bit of time and likes trying products.